Sometimes life is more like a bumpy roller-coaster than, say, a scenic country road or straight highway. Now would be one of those times :). During such periods, I like to turn to old favorites like peanut butter and chocolate. Whether paired with bananas or cream cheese, this duo has never failed to please. And it doesn't hurt either that my boyfriend is a huge fan. I found these fun sandwich cookies in a gorgeous new baking book I got for Christmas (thanks, Nancy!). The cookies baked up with a delightfully crumbly texture and rich peanut-y flavor. Their size became quite the mystery, however. Even being generous with my "1/2 inch" diameter balls of cookie dough, I got nearly twice as many cookies as the recipe says. Making them took me so long that I went with a simple ganache instead of the filling in the book. For you fellow bakers out there, what do you do when a recipe is wonderful in some respects but off in others? Remake and tweak it until you're satisfied or look for a completely different recipe for the same thing? The sizing issue, though vexing at the time, will be easy enough to remedy, so I'll definitely keep these yummy bites in my repertoire :). XIAOLU'S NOTES: Following the recipe, I got nearly 4 dozen sandwiches. So I'd recommend making larger balls (3/4 to 1-inch) or, if you like the look of these tiny bites, setting aside some extra time/patience to form the smaller balls! I've read that the filling is a winner, so I'm posting the original recipe below and plan to try it next time. In the bowl of an electric mixer fitted with the paddle attachment, beat the butter, brown sugar, and confectioners’ sugar on medium-high speed until light and fluffy, about 2 minutes. Add the peanut butter and beat to combine, scraping down the sides of the bowl as needed. With the mixer on low speed, slowly add the oil, vanilla, and egg and beat until just combined, about 20 seconds. Add the flour mixture, beating just to combine. Lightly flour the palms of your hands, and roll the dough into balls about 1/2 inch in diameter. Place them about 1 inch apart on the prepared baking sheets. Bake, rotating the sheets halfway through, until the cookies are golden brown on the edges, about 12 minutes. Combine the chocolate, peanut butter, confectioners’ sugar, and salt in a medium bowl. In a small saucepan, bring the cream to a boil. Remove the cream from the heat and pour it over the chocolate mixture. Stir with a spatula until the chocolate is completely melted. Set the bowl in an ice bath, or chill it in the refrigerator, until the filling has cooled to room temperature and is thick enough to spread. Then use it immediately or transfer it to an airtight container and refrigerate it for up to 1 week (let it come to room temperature before using). Using an offset spatula, spread 1 teaspoon of the milk chocolate filling [or ganache] over the flat sides of half of the cookies. Sandwich with the remaining cookies, flat sides together. Once filled, the cookies are best eaten the same day, but they can be kept in an airtight container in the refrigerator for up to 3 days. These are just the comforting cookie combination that I would want! You can never go wrong with PB+chocolate! That's happened to me before - ended up with almost 100 biscuits! The family benefited and got the ones we couldn't eat. Ahh these look delicious! I like the look of smaller cookies but it definitely takes more time to make all of them. It's been a long time since I've used this combination! They look yummo! I tend to look for another recipe if the one I have used is a bit off, there are just so many recipes out there! There's nothing more comforting to me than peanut butter and milk chocolate! I bet these go perfect with a glass of cold milk! Your photography is amazing as always. May I ask what kind of light you use? These look adorable! I tweak the recipes, to get my idea of a perfect one! Oh yep...you can't go wrong with peanut butter. These sandwich cookies look adorable. These look delicious!! Can't go wrong with peanut butter and chocolate! Your photo looks great. Mmmm. They look delish! Looking forward to trying them, but I think I'll halve the recipe to start. Two dozen is plenty! You certainly can't go wrong with peanut butter and chocolate! Can't wait to try the filling, it looks creamy and amazing. you can never go wrong with peanut butter and chocolate combo...one of my favorite! The look fabulous, and your photo is beautiful! Beautiful photo! So calming and pinky!! your title may contain the truest words ever spoken. lovely treats! These cookies are SO cute! They look like cookies masquerading as macarons. When I come across recipes that don't work out, I usually abandon them in search of a better one (unless it's something small like the yield size that's not right). These look fantastic, I'm going to make some. 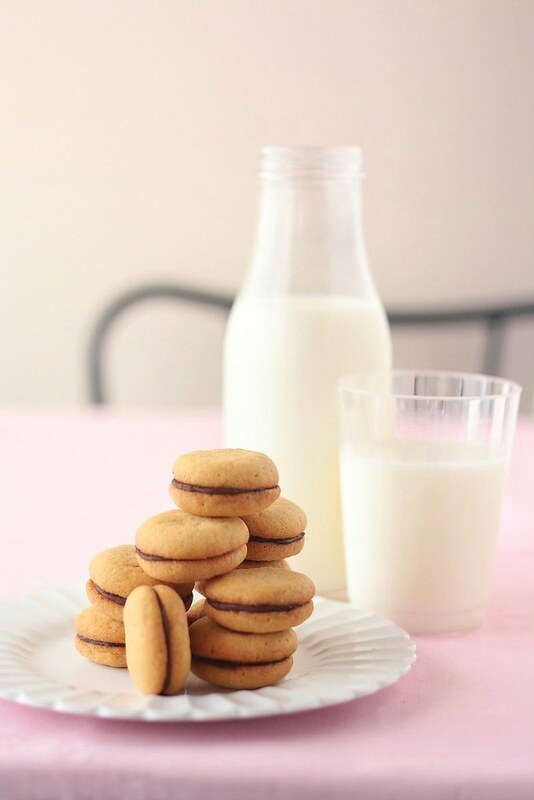 Love comforting cookies, peanut butter + chocolate = heaven!